We fully understand you have very specific requirements for how you want you products delivered in a safe and timely manner. In order to care for them in a very careful manner, we have made an investment in maintaining our own fleet of trucks ranging from more convenient and flexible straight trucks to the larger, more able 53 foot trailer trucks. 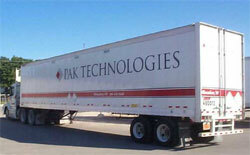 We staff these trucks with our own employee drivers. This enables us to provide you with a driver that is familiar with your product and account as well as your facilities and their shipping and receiving requirements. We think most of our competitors underestimate the importance of consistency and reliability when it comes to this activity. They tend to turn to a heavy use of contracted services for handling your products. We believe it to be too vital of a link in your service offering to leave to someone else, someone you have no control over.